What should I wear to Zumba class? You can wear sweat pants, yoga pants, shorts, or t-shirts. Basically, you can wear anything comfortable. Women will also need a good sports bra! If you want to purchase Studio Groove Fitness Gear, contact me. What do I need to bring with me to Zumba class? Drinking fountains are available at all locations but it's nice to have your own bottle. You should also bring a small towel. What kind of people do Zumba? Anyone can attend a Zumba class because it's really a big party. You do not need a dance or fitness background. As long as you can keep moving and have fun, you'll be fine. There is no pressure to dance or exercise exactly like anyone else. I haven't worked out in a long time. Can I take a Zumba class? Of course. Zumba is a combination of simple moves that anyone can follow. But, if you have not exercised in a long time, please see your doctor to obtain clearance to start classes. All of the steps can be modified so that everyone can enjoy the class. Zumba classes can be intense, so go at your own pace. Take a break when you need one, drink plenty of water, and listen to your body. No one knows your body as well as you do. What are the best shoes to wear for Zumba? Zumba Fitness recommends that you wear "cross training" or "aerobic" style shoes. They provide the cushion and medial lateral support needed for side-to-side movements. They also have low traction rubber for easy sliding and turning, and allow one to pivot on the ball of the foot without putting pressure on the knees or hips. Running shoes are NOT recommended since they have a lot of traction. You risk torquing your knee on some of the turns or twisting steps. 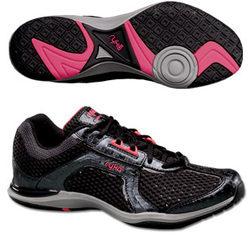 Nike, Reebok and Ryka make several styles of "dance" shoes for women. You can identify them by a flat circle on the ball of the sole under the big toe. For men, Nike makes a Kickboxing shoe that will pivot on the ball of the foot without pressure on the knee or hip joint. I've also seen some men wearing the new Reebok Easytone shoes and they seem to pivot well, too. If you can't find a shoe with the flat pivot circle, look for a supportive cross trainer. There's no need to be nervous about your first Zumba class. Just enjoy the music and start to move! I try to pick the most irresistible songs I can find that will get you grooving. Each song has its own set of steps. The choreography is simple and once you get the hang of it, you'll be able to add your own style and pick up the intensity. It may take a few weeks to "get" the salsa beat or control your hips during a samba song, so it is important to be patient and just focus on moving and enjoying yourself. Zumba does not use a lot of verbal cuing so we really want you to get into the music and feel where the changes in steps will come. After a quick hour of dancing and exercising, you will leave feeling invigorated, happy, and motivated to come back. Can men attend Zumba class? Are you kidding me? 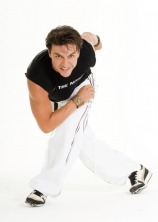 Zumba was created by a man by the name of Beto Perez. Men can exercise and men can dance, therefore men can do Zumba. The men that attend Zumba class love the class because the results are real. Once the music starts, you really do forget you're working out and the time passes quickly. All you have to do is watch the instructor, try to follow and enjoy yourself with the other participants. The number of calories each person burns per class varies. However, depending on your body parameters (type, composition, intensity, range of motion), you can burn hundreds of calories per class. The best way to determine how many calories you are burning is to obtain a heart rate monitor. You can find them at any local sporting goods store or online.